It’s very easy to become so consumed in making sure the holidays go smoothly that you forget to relax and actually have a good time. Ideally, the holidays should be a time to unwind, spend time with loved ones and create new memories at fun events and festivities. Sometimes, the best way to actually enjoy the holidays is to escape from your normal holiday routine and embark on some new adventures. Garden Valley, ID is full of rustic charm and offers a series of fun indoor and outdoor holiday/winter activities in the mountains. Starting November 24th, GARDEN VALLEY HOLIDAYS IN THE MOUNTAINS…an old fashioned experience! WWW.GVchamber.org will treat travelers and guests to an abundance of activities all can enjoy, including snowmobiling, cross country skiing, sledding and wagon and sleigh rides every day. Also on November 24th, the annual Santa Parade will take place, as well as the Ugly Sweater and Vest Contest at the Dirty Shame Saloon. Other popular activities include feeding elk, an elf scavenger around town at the local merchants, and everyone’s favorite holiday pastime, shopping. You can shop for Christmas trees, Santa hats, poinsettias, wreaths and holiday gifts at the local boardwalk shops and the Crouch Mercantile Exchange Mall. Plus, every Friday and Saturday night there will be a community bon fire at the Longhorn Saloon that will help you get into the holiday spirit with Christmas caroling and free hot chocolate. Additionally, you and your group can enjoy a day of snow tubing with Idaho X-Sports during the weekends. Other fun holiday events include the Last Gasp Bazzar on December 15th, the Christmas Ball on December 22nd and a series of New Years Eve celebrations. The highlight of the New Years Eve festivities will be the Dutch Oven Cook Off, hosted and sponsored by Uncle Billy Bob’s, Idaho’s favorite redneck resort. Festivities will take place in our #2 lot and is also sponsored by Longhorn. The cook off will be a fun celebration and competition as we anxiously count down the final hours of 2012. 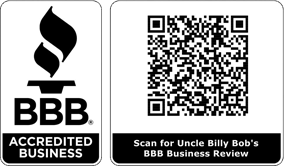 Please let us know if you have any questions about the upcoming events in the Garden Valley area, or if you are looking for a unique place to stay in Garden Valley during the holidays, because Uncle Billy Bob’s has you covered with 3 locations to choose from. Happy Holidays from the staff at Uncle Billy Bob’s!